I’ve started a dialog with a few of you about getting Silverlight and service integration working, specifically with ASP.NET web services (and even WCF ones). A few have downloaded some of my samples, but others have started from scratch. A few have reported getting some interesting errors, ASYNC_blahblah and NotFound errors specifically. While this was boggling my mind (as I wasn’t getting them), a reader’s comments pointed me along the lines of something…he mentioned “maybe it is because my web service is ASP.NET 2.0 and not 3.5” – of which that shouldn’t be the case, so I went to test that. Most of the samples you are likely seeing (including mine) are implementing web services within the same project that the Silverlight host is implementing. What I mean to say is probably you are doing File…New…Silverlight Project and then incorporating the web service into the web site project that comes with that template. If you do so, you probably aren’t running into problems. 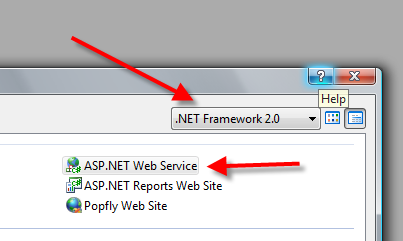 Also note that the target framework of that default web site project is .NET 3.5. This doesn’t make a difference, but I’m just noting it here. But what if you have an existing service, or you have an existing web site project that you are running in Visual Studio and running into problems…and l think I know why…let’s investigate by doing this step-by-step. Do nothing more to the service. We’re just going to use the HelloWorld stub for this experiment. We know we’re going to simulate a cross-domain situation so create a clientaccesspolicy.xml file at the root of this project. You can use my snippet to do the default public policy quickly if you’d like, it’s wickedly cool and awesomely awesome. I recommend it ;-). Moving on… We are done here. CTRL+F5 this bad boy to start it running (or select Service.asmx and view in browser) – we just need to get the service running. Make note of the URL, it is likely http://localhost:XXXXX/FooService/Service.asmx where “XXXXX” is the random port assigned by VS. Just note that URL. Obviously if you didn’t call yours FooService, then it will be different. 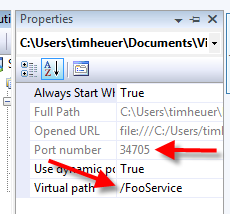 Start another instance of VS2008 and choose File…New…Project…Silverlight Application. I’m calling mine FooApp. Now, if you don’t see any of the Silverlight templates, just change the target framework back to .NET Framework 3.5 if you haven’t done so already. Accept the default for creating the FooApp_Web project for you, we’ll need a host here anyway under HTTP. What we are doing here is calling the service (asynchronously of course) and wiring up the completion event to emit a new TextBlock with the result of the web service. The Page() constructor just adds a Loaded event so we aren’t doing anything in the constructor to the XAML before it is done loading. Okay, so we are done. We have our web service with an appropriate clientaccesspolicy.xml file and it is running. We have our Silverlight application with a service reference to that and proxy code generated. We are using that proxy code to call the service, and use the result in a new TextBlock in our root layout element. Sweet. Put a breakpoint on the exception catch (should be line 37) and hit F5 (choose yes to enable debugging in web.config). Did you get ‘Async_ExceptionOccurred’ like I did? Sonofa… Maybe it is because I’m accessing an ASP.NET 2.0 service? No. Maybe it is because my app is on port YYYY and my service is on port XXXX? Nope. Ah, cross-domain issues? Try again. Okay, on to figuring out what is going on. If you are a web developer and you aren’t using an HTTP sniffing tool, shame on you. This should be one of your biggest assets when doing web client development like Flash, Silverlight, AJAX, whatever. For Microsoft developers there are usually 2 tools (both free) that come to the top: Fiddler and Web Development Helper. I’m a HUGE fan of WebDevHelper (which I just noticed is on CodePlex now, cool Nikhil!) for 2 reasons. First, it doesn’t require me to change my proxy settings or anything, which is a pain when using Fiddler and the built-in web server with VS because of the dynamic ports it uses. Second, it is IN THE BROWSER! I turn it on and I get an explorer bar at the bottom that shows me everything. Me likey. Spot it? Remember our service was created on http://localhost:XXXX/FooService/Service.asmx? 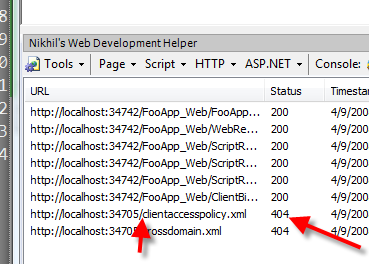 If you read my previous post on cross-domain access (and soon a how-do-I video will be posted on this topic), you’ll note that the client access policy file must be at the ROOT of the service site. The core problem was that it couldn’t find the clientaccesspolicy.xml file and thus denying the request to the service. For *this* scenario, the solution (or one of them, easiest in my opinion) is to change the service properties and just change the /FooService to “/” only. This will restart the server for that project (browser to Service.asmx again just to make sure) and will then be operating under http://localhost:XXXX/Service.asmx. The next thing we need to do is go back to our Silverlight application and remove the service reference (as it is now invalid because the endpoint is no longer there). Just select it and delete. 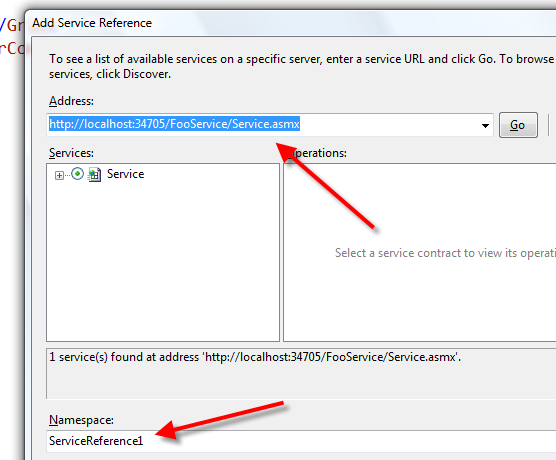 Choose ‘Add Service Reference’ again and point to the newly updated URL. No need to change/delete the actual code in Page.xaml.cs because it will stay the same as long as you keep the SericeReference1 default name for this example. Again for this scenario (if you are playing around with Silverlight and just messing with services), this may be one of the issues you are running into. A lot of the time cross-domain policy files may be the issue and that is why an HTTP sniffer is going to be your best friend to see what request is failing and why. Even though this is an ASMX sample, if you were testing with a WCF service hosted in an ASPNET web site and running under VS2008 web development server, you'd likely run into the same issue.